Following the events of INVASION, Wonder Woman and Captain Atom must locate the missing Steve Trevor, while the citizens of Themyscira witness the arrival of a new man on their island. This volume also includes the origins of both Cheetah and Silver Swan, the appearance of a lost tribe of Egyptian Amazons and more! 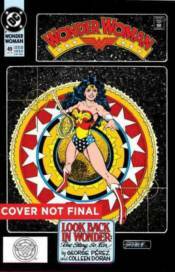 Collects WONDER WOMAN #25-45 and ANNUAL #2.